Degani Bakery Cafe is a chain that currently consists of 14 outlets with another 5 on the way. As I was in the neighbourhood I thought I'd pay a visit to their newish cafe in Camberwell. The interior is very much dark polished floorboards, maroon leather banquettes and bentwood chairs - a nod to the '70's I think. 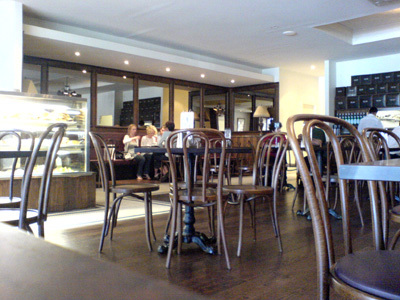 The banquettes are very comfortable - nice deep seats though I think those bare wooden seated version of the bentwood chairs might be a trite uncomfortable (the padded versions are only offered along the banquette tables). Next to the large front windows is a more intimate seating area though it's a bit to "franco cozzo" for me. Service actually exists here unlike our Brunetti experience - sit at a table, peruse the menu and their eager staff will come and take your order. 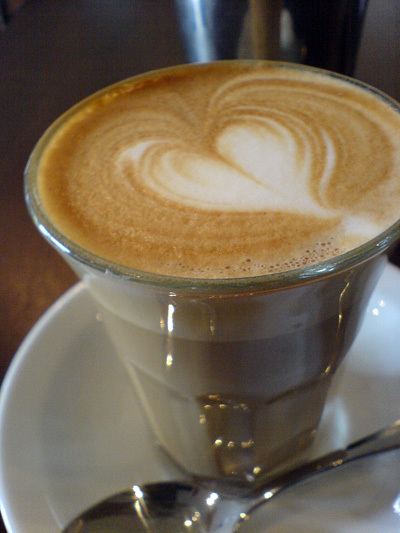 First up was my cafè latte - isn't that heart just cute. There are chalk boards behind the bar area that list the drinks available and apparently the coffees are made by an "Australian Barista Champion". As this is Camberwell, the coffee was a little on the hot side but not too bad. 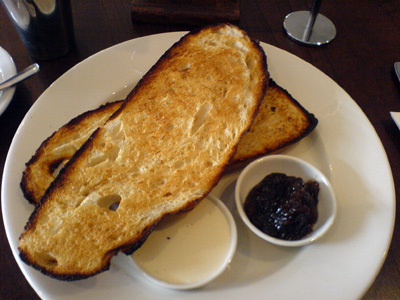 I also decided to try their Sourdough Toast with Fig Jam and Mascarpone ($8.50). They are huge slices of sourdough and how refreshing to find that they are toasted on both sides! I don't know why or when it started happening but I can't stand those one side only toasted toast. The sourdough is made by Degani - there wasn't quite enough jam but they happily gave me more when asked. consistency rears its ugly head. Gone is the latte art and the coffee temperature has also risen. I also noticed when I went to pay that the rest of the coffees he was currently making were also bearing this lack of design. I'm not sure but I would think that an "Australian Barista Champion" would be able to maintain the consistency. Thank you for such a nice experience he service was great staff were very attentive and had a nice smile, the food was of high quality and the price was very affordable. It was nice to have the owner attend to us as customers it felt very special. 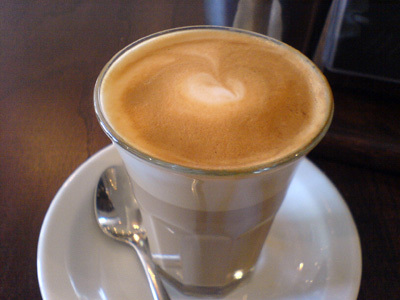 I'm not sure if i had this so called 'champion' barrister on call, but the coffee i had was very good. It was consistent and two different people made it and it was the same both times, good milk and a good shot. As for temperature it was exactly drinkable when it hit my table in under, and only took 5 minutes. I wasnt able to eat as I only dropped in for a quick drink, but the menu has been upgraded and a specials board is now availible, with nice meals availible. The staff were very nice and easy to chat with. Great stuff keep it up. My post was written in February and since then there have been many changes at this Degani - the champion barrister vanishing shortly after this post went up. Coffee quantity depends on who makes it. i find the first 2 anonymous comments dubious? anyway, thanks for reviewing this. i moved to hawthorn east a few months back & have been quite disappointed with the cafe food quality at camberwell. i enjoyed degani's lemon ricotta muffin, just the right tang & sweetness. it's large size is suitable only when you had a light meal prior. sis didn't enjoy her friand though, too sweet and a friand texture should be more dense/compact. she also thought the coffee was only ok. friendly service, we like..